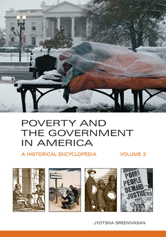 Poverty and the Government in America offers topical entries on policies implemented to alleviate povertytheir historic contexts, rationales, and legacies. The encyclopedia also features separate essays on how poverty has been addressed at federal, state, local, and Native American tribal levels throughout U.S. history. Complimented by a richly detailed chronology and a wealth of primary documents, these features help readers grasp both the broad contours of government efforts to fight poverty and the details and results of specific policies.